The websites www.NationalChildrensDay.us and www.ChildrensDay.us are portals for the expansion and revival of Children’s Day on the second Sunday in June (2018 - June 10) in the United States, by giving faith, hope, love, and commitment to our children. 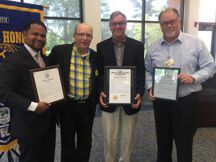 Photo Right: Display of proclamations...(L) Aurora Mayor Richard Irvin displays City of Aurora mayoral proclamation, Kiwanis Club of Aurora President John Ross and Children’s Day advocate; 2018 proclamation for “Children’s Day” from Governor Bruce Rauner is held by Aurora Deputy Mayor Chuck Nelson; Bill Donnell - Immediate Past President of the Kiwanis Club of Aurora holds a proclamation from Batavia Mayor Jeffery Schielke. Americans recognize Mother’s Day, Father’s Day... so why not a national Children’s Day ? A day that revives, celebrates, and commits to our children and their future. Committments cards; along with local, state, and national recognition are all part of this day... a day that has deep historical roots in America. Help spread the word about Children’s Day 2018! Yes, children need to feel loved and accepted every day. However, it also is important for them to have their own special day. John Ross, advocate for Children’s Day on the second Sunday in June (June 10, 2018), is part of a growing movement spear-headed by the website www.nationalchildrensday.us, which hopes attitudes of Americans will change regarding a special day for children. He notes that American families and the entire country need this day to love, evaluate, and commit to the betterment of our children. • Every year more than 3.6 million referrals are made to child protection agencies involving more than 6.6 million children (a referral can include multiple children). The United States has one of the worst records among industrialized nations. • A staggering 2.5 million children are now homeless each year in America. This historic high represents one in every 30 children in the United States. • The U.S., which had some of the highest graduation rates of any developed country, now ranks 22nd out of 27 developed countries. Since 2007, the governor of the state of Illinois has proclaimed the second Sunday in June to be “Children’s Day.” The cities of Aurora, Ill.; Batavia, Ill.; Fort Collins, Colo.; Vancouver, Wash.; and other such cities have issued past proclamations too. Numerous churches and denominations currently observe the second Sunday in June including the African Methodist Episcopal Church, African Methodist Episcopal Zion Church, Christian Methodist Episcopal Church, and the Church of the Nazarene. The Children’s Day website, www.nationalchildrensday.us, offers helps and also challenges parents, individuals, churches/houses of worship, schools/places of education, government/community and businesses to sign commitment cards directed at affirming America’s children. They pledge to “commit myself (ourselves), in the coming year, to love, cherish, nurture (physical, mental, emotional, & spiritual needs), and affirm...” They also can make a commitment beyond America to the world’s children.